Just who are the Gideons? A bunch of people with a lot of spare books it seems. Given how many hotels have Sky, I'm at a loss to understand why the international traveller may need additional comfort, but somehow these guys have infiltrated every single room on the planet, to the point where I'm disappointed if I open a bedside drawer and don't find a bible. They are truly omnipresent, which I guess is part of the message. I wonder if this evangelism on the sly ever works? I mean, like any large organisation, they must try and work out how successful they are, wouldn't you think? Do they not have stats? Or is it purely based on how many books they can shift? In my view it has to be the latter, as the former is patently impossible - I've never been asked to take a survey. So, make a Gideon happy this Christmas. 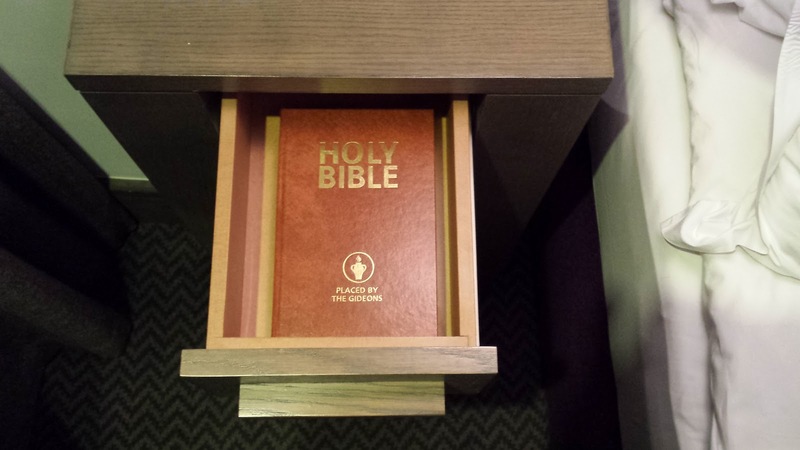 Take a hotel bible home and recycle it.